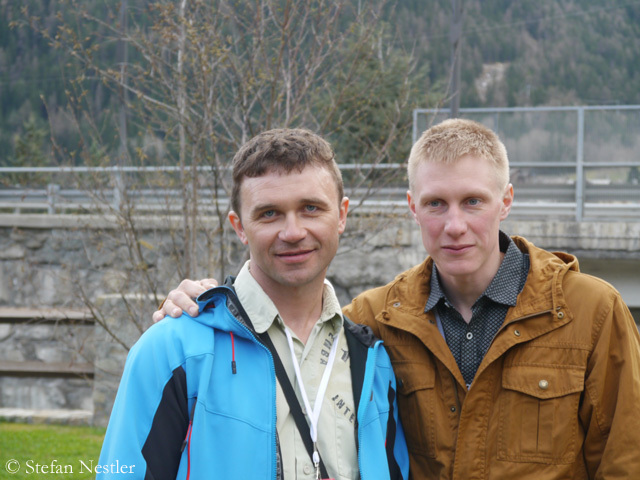 Apparently, the two climbers had turned around on Tuesday at an altitude of almost 7,000 meters. Due to bad weather with rain and snowfall, a rescue helicopter of the Pakistan army has not yet been able to take off. The rescuers want to get Gukov off the mountain by using a long line. 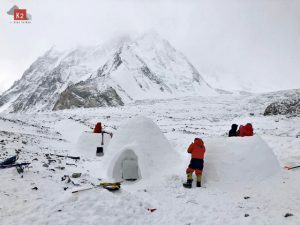 Some climbers have offered to participate in the rescue operation – including Italian Herve Barmasse and German David Göttler, who want to tackle the Southwest Face of the 7,925-meter-high Gasherbrum IV this summer. They would have to be flown by helicopter to Latok I. On 12 July, Gukov and Glazunov had set off to climb the North Ridge for the first time up to the summit. This goal has been so far a too hard nut to crack for many top climbers from all over the world. Since the legendary first attempt in 1978 by the Americans Jeff and George Henry Lowe, Michael Kennedy and Jim Donini, who were forced back by a storm about 150 meters below the summit, about 30 attempts to master the route failed. 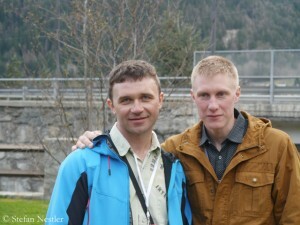 Gukov is well known in the climbing scene. 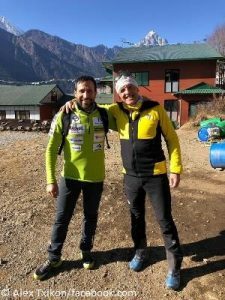 In 2015, he was awarded the Piolet d’Or, the “Oscar of the Climbers”, together with his compatriot Aleksei Lonchinsky for their new route via the South Face of the 6618-metre-high Thamserku in Nepal. Other members of the Russian Latok I expedition had tried to climb the North Face. They were forced back by rock fall. “(We) descended to Base Camp alive, but helmet, rib and bones are broken,” Victor Koval reported to Russia. 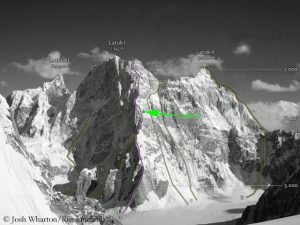 “Finally, an avalanche hit us.” A Slovenian expedition is also on site to tackle the North Face. 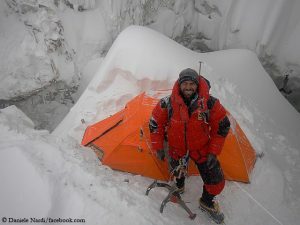 The two German climbers Thomas Huber (the older of the Huber brothers – the younger, Alexander Huber, is currently with Fabian Buhl en route on the 6,166-meter-high Choktoi Ri, in the Karakoram too) and Rainer Treppte as well as the South Tyrolean Simon Gietl have their bags packed. 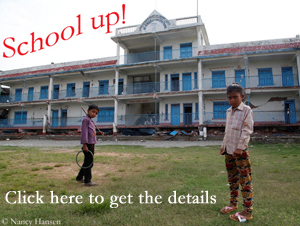 Their destination: the North Face of Latok I.
Update 27. Juli, 11 am: Alexander Gukov has contacted Anna again: “Damn! Where do all the avalanches come from? I can’t even boil water.” Meanwhile, it is being considered to supply the climber with equipment from the helicopter. It is possible that Alexander would then be able to descend on his own.